Leer Photography is owned by Cindie, Lee, Kaitlyn, and Madison Leer and has been in business for over 19 years. We are a full-time portrait photography studio located in York Springs, Pennsylvania. Cindie is a graduate of the New York Institute of Photography and graduated earning two of the highest awards they offer their students. She has also earned various blue, red, and white ribbons through professional competitions offered through PPA of PA, Inc. Cindie and Lee are members of the Professional Photographers of American and The Professional Photographers' Association of Pennsylvania (PPA of PA, Inc.). They are also members of Senior Photographers of America, The Shine for Him Project, NILMDTS, and NAPPA. They continue their education at various photography classes, seminars, and conventions throughout the state and country. On a personal level, Cindie and Lee are members of the York Springs Fire Company and Ambulance, the Bermudian Jaycees, Hanover Area Parrotheads, an active supporter of the American Cancer Society, and their church. Leer Photograhy is run by Cindie and her husband Lee. Cindie is the Business Manager and Photographer. Lee is the accountant/book-keeper. Kaitlyn Leer is our Office Manager and editing specialist with a Bachelor of Science Degree in Graphic Design. Madison Leer is our second Photographer and is a graduate of the New York Institute of Photography and graduated earning various awards for photography. 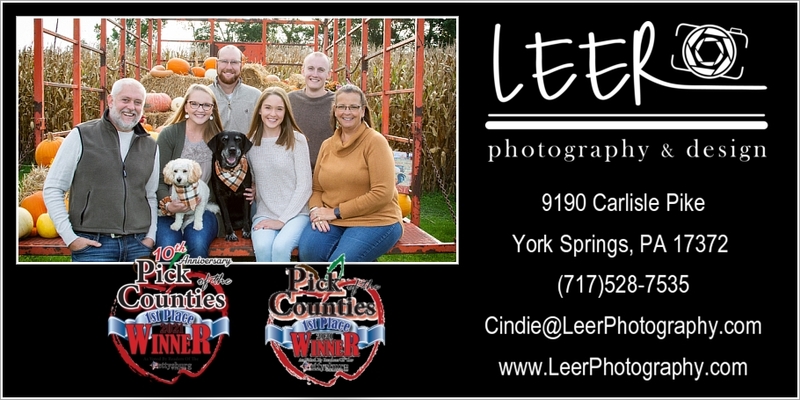 Leer Photography is located at 9190 Carlisle Pike, York Springs. Thank you for your interest in Leer Photography.